Tonight is the First Thursday Art Walk in Portland, Oregon. I have a couple paintings in a group show at Anka Gallery. The show runs January 1, 2011 until January 28, 2011. This January The Anka Gallery is proud to extend the Resonance exhibit with additional new works by 25 local artist and designers. If you’re in Portland, Oregon this week stop by the Anka Gallery and see my new series of paintings From Cradle to Grave: The Color White, and the work of three other featured artists. The spacious Anka Gallery is located in the Old Town neighborhood’s Everett Station Lofts. The opening reception is First Thursday, October 7, 6pm-10pm. 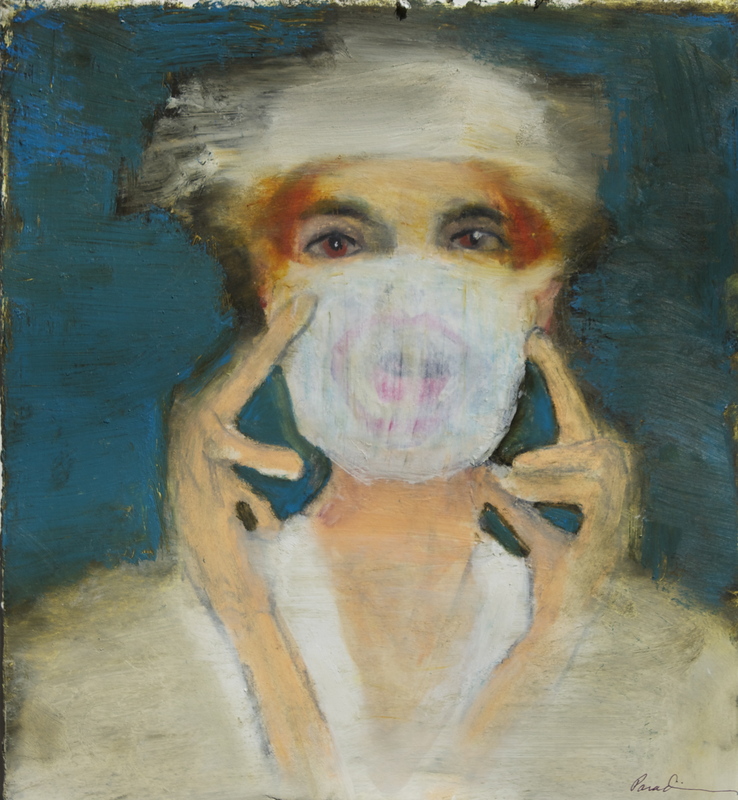 Thank you to American Journal of Nursing art editor, Sylvia Foley for mentioning my October show, From Cradle to Grave: The Color White in yesterday’s post on the AJN blog Off the Charts. The link to Portland’s Anka Gallery is also appreciated! I believe this to be true, so my strategy for managing the unexpected things that happen while preparing an art exhibition is allowing ample lead-time. Since I’ve been exhibiting for a while, I have a checklist of universal tasks such as documenting the work, updating business cards, making post cards, vinyl lettering, framing, etc. If the artwork is traveling to a gallery in another city, I build in time for packing and shipping too. Once the paintings are made, I begin crossing tasks off the checklist. Even so, the unexpected will occur. Take yesterday morning, for instance. When I began this post, David was solving a printing problem we discovered the night before. Several hours later, he fixed the problem and we made the prints. However, it delayed their delivery to Luke’s Frame Shop for packaging a few days, because the ink has to dry and cure first. Sometimes unexpected occurrences are positive. 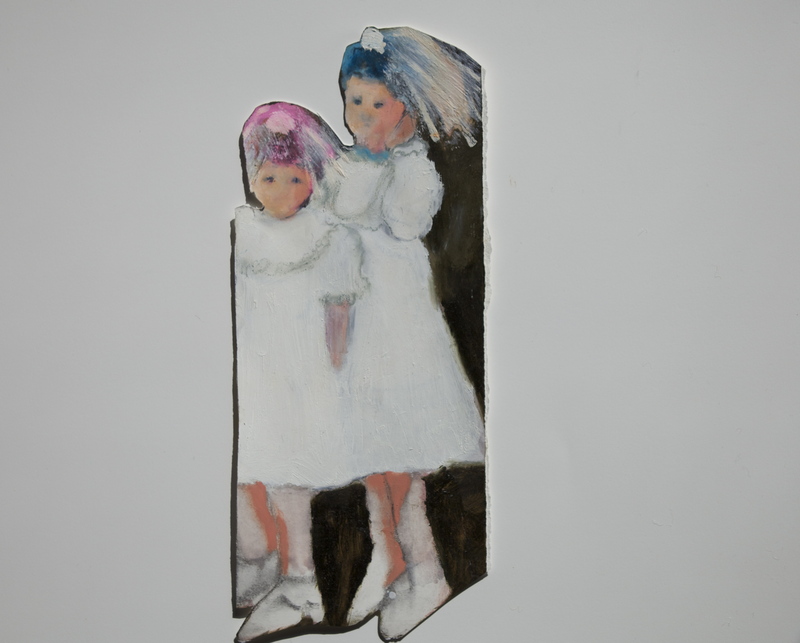 Last week, while showing the From Cradle to Grave: The Color White portfolio to Anna Solcaniova King (see Pulling a Rabbit Out of Her Hat: An Interview with Anna S. King), curator and co-owner of Anka Gallery, I discovered a new relationship between two of the paintings, strengthening each. This morning, I’m writing my artist bio for the show. Maybe it’s my experiences as a cancer survivor and an oncology nurse that makes the task feel like a prelude to an obituary. I can’t help it. Nowadays, with electronic media, I’m aware that every word I write about myself is recorded somewhere in cyberspace. The days where an artist or writer could destroy early work, and preserve only the work they wished to represent them after their death, are over. Same with the artist’s statement. 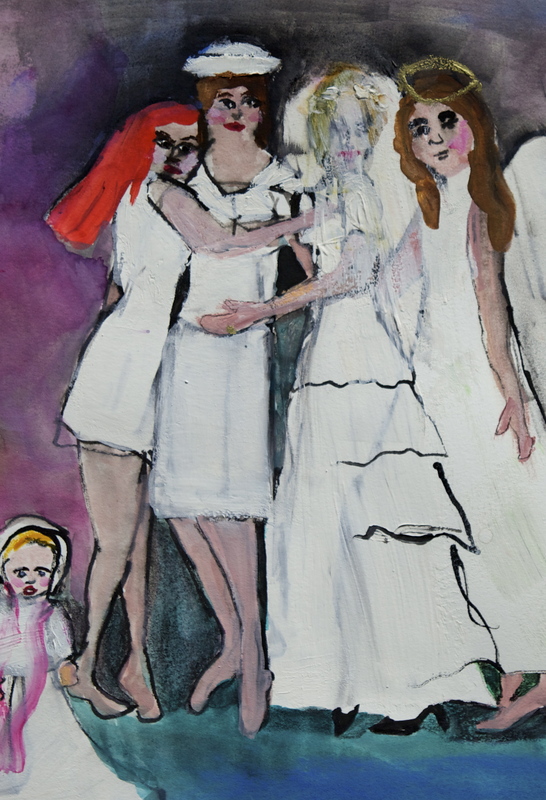 When my thoughts about From Cradle to Grave: The Color White deepen and mature over time, the words I write about the paintings today may someday contradict my insights of the future. I hate feeling committed to an inflexible opinion as if my thoughts are butterflies pinned to a board and hung on a wall in a picture frame. I want the freedom to explore and gain wisdom. But a thoughtful artist statement is required, and so I do my best to express who I am, and what my painting and writing are about, knowing that if I’m lucky enough to live a long life, some of the information will change. Like my art, I am evolving. David and I were at Luke’s Frame Shop , getting things ready for my upcoming show. David lugged in the original Love You to Death, which Luke framed for us awhile ago. Unfortunately, we had to tear it out of its frame to re-photograph it for The American Journal of Nursing cover, and are finally getting around to having the matting repaired. I was happy to find out that Luke can cut foam board backing for the giclee prints of Love You to Death. Love You to Death will be on exhibit and prints of it are available at Anka Gallery in October, along with new paintings. If you’re in the neighborhood, stop by Luke’s Frame Shop and see the poetic, charcoal drawings of insects and roosters by Portland artist April Coppini. Her show is up through October 7, 2010. Last First Thursday, I was at Anka Gallery . The group show, which runs until January, is a benefit for P:ear and Outside In. The opening was well attended, despite competition from the historic Civil War match in Eugene. I meant to visit Tribute Gallery , but became distracted by Olaf Gambini. Then, two separate and intense conversations with two not so different people kept me at Anka. A conversation is intense when the persons speaking start looking around the room, wondering if they’re being overheard, and if so, what the fallout might be. I met an activist who is still advocating for single payer Healthcare Reform. I have to admit my disappointment in Healthcare Reform, as the plan I read about becomes increasingly confusing while serving only a part of the uninsured population, for an increasingly incomprehensible amount of money. The activist has not given up on single payer Healthcare Reform, and I felt hopeful again, even if it’s just my idealism showing. I met an artist earning his living outside of his fine arts career. I’m intrigued with how other artists pay the bills while staying true to their artistic integrity. It’s a touchy subject for some of us. While accepting commissions for art is considered “acceptable”, working as a nurse, or even in a totally art related field such as graphic art, is sometimes looked at with condescension. Andy Warhol withstood this type of snobbery while trying to break into New York’s art scene. A successful magazine illustrator, Warhol’s fine arts peers negatively labelled him a “commercial” artist. However, the outsider Pop Artist proved himself a master of marketing, possessing an uncanny insight of American consumerism, by creating The Factory. It became the exclusive hotspot for everyone who was anyone. You needed an invitation to get in. Suddenly, Andy Warhol became an icon and decided who was hot and what was art. Snobbery crosses all societal lines, whether it’s deciding who’s a “real” artist, or who deserves healthcare. I ask artist Tamara English questions about her work and inclusion in Mark Woolley’s group show in October at Anka Gallery. Follow this link http://www.pdxartscene.com/ to read the interview. After the Interview, What’s Next? 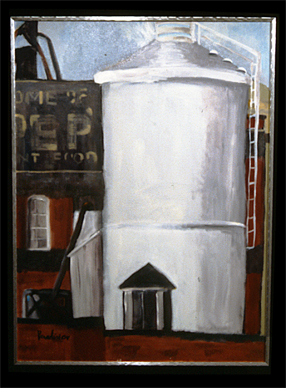 Thank you to all who watched the Art Talk with Richard Schemmerer interview this afternoon on pdxArtscene (http://www.pdxartscene.com/). I’ve been informed that the audio was difficult to hear. The taped version will post soon on pdxArtscene, with boosted audio. It was a fun experience. Richard Schemmerer is a great guy, and it was a pleasure to meet digital artist Nance Paternoster too. Thanks to Anna Solcaniova King and Graylan King for inviting me to the Anka Gallery for the interview. They are also the co -creators of pdxArtscene. A few days ago I received an email from Molly Jochem, informing me that my painting Broken in the Fall (2009) has been juried into Siren Nation’s (www.sirennation.org ) The Journey show, curated by Molly at Olympic Mills (http://www.myspace.com/olympicmillsart). The Journey exhibition runs October through September 2009. I’m honored to have a painting included. Love You to Death comes out on the cover of the American Journal of Nursing in October too.